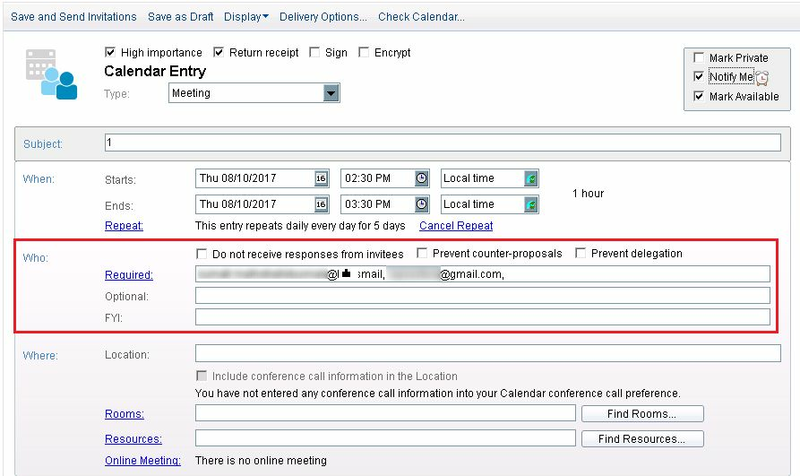 How to Schedule, Send & Verify Meeting Invitation in Lotus Notes? 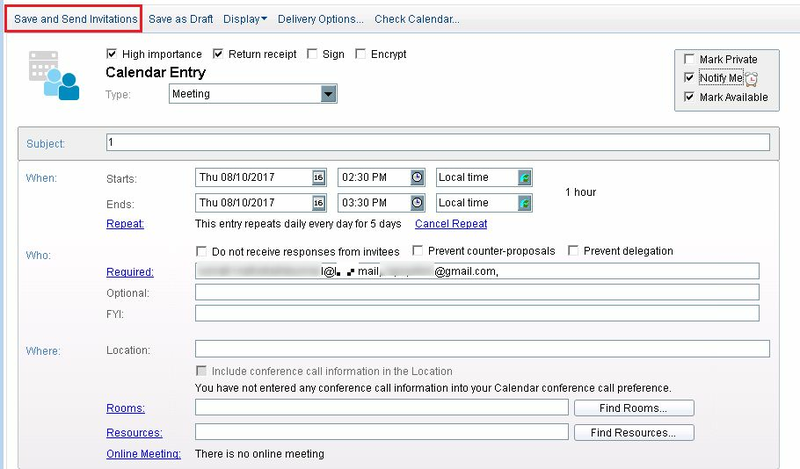 What is Lotus Notes Meeting Invitation? Lotus Notes is an email client through which one can schedule meetings. It helps users to simplify their work by arranging and scheduling tasks. These days, everyone is so busy that sometimes they forget or missed their important events and meetings in their organization. So, with the help of this article, you will know how to schedule a meeting in Lotus Notes 9 email application. 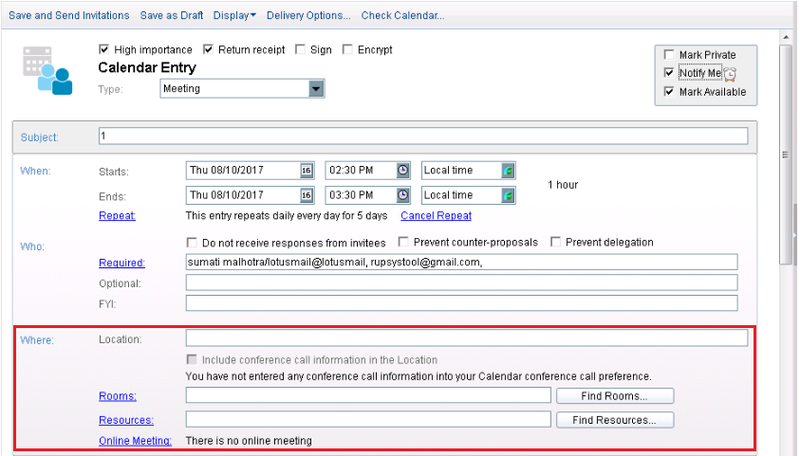 How to Create & Send Meeting Invite in Lotus Notes? Launch IBM Lotus Notes application. Click on File >> New >> Calendar Entry. To organize a meeting, click on the Meeting from a drop-down menu. 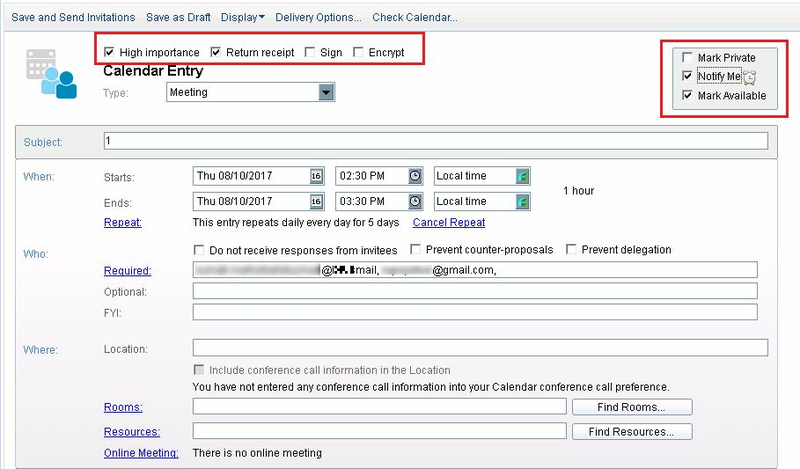 You can select above check boxes as per the meeting priority. If the meeting is highly important to attend, if a user needs a receipt from the users he invited in the meeting, Encrypt the meeting, Mark the availability of user to his invitees, etc. 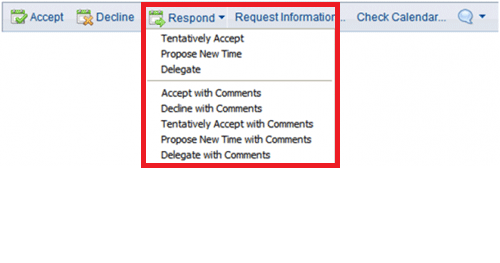 There are three attributes to schedule a meeting in Lotus Notes 9 i.e. When, Who and Where. 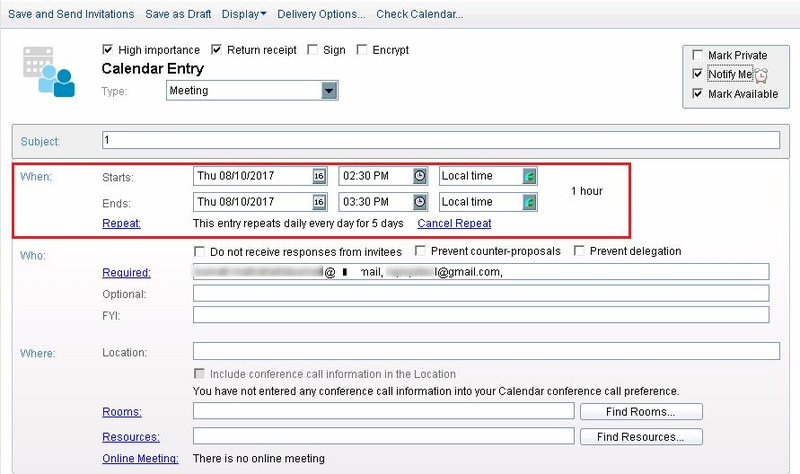 In When segment, you need to specify the date, time and time zone of the meeting. Starts: In this section, specify the starting date of the meeting which includes date, time and time zone. Ends: Here, specify the ending date including the same details as it in Starts section. Repeat: You can also repeat the schedule for the number of days you want this meeting to conduct on the same time each day. Cancel Repeat: If you have created any repeated schedule then you can cancel it. Now in Who segment, you need to include the users that are invited to attend the meeting. Required: Include all the users that are required to attend the meeting. You can specify candidate name or email in this section. Optional: This is like CC of the mail. FYI: As Optional, it acts like BCC of the mail. In the Where segment, you need to define the place where the meeting will be held. Location: Specify the location of the meeting to be organized. Rooms: Reserve a room to arrange the meeting. Resources: With the help of this section, you can apply for the required resources. Online Meeting: If the meeting is online then you can click on this option. Now you are retrieved back to the same window. In Description, you can also attach any image or document or any message in a meeting as shown. Now click on Find Available Times to know whether the invitees are free to attend the meeting or not. This helps in scheduling a meeting in Lotus Notes easily. The graph shows the status of the users that are invited to the meeting. Green: If the time slot of the meeting gets matched with the mentioned time of all candidates, then it turns Green. White: It informs about the availability of candidates. Red & Pink: It displays the details of the candidates that are not available. Grey: It shows no detail of the invitee in the desired time slot. Light Greyish: It shows some restrictions that are applied to the given details. Due to which it can’t be displayed on the screen. 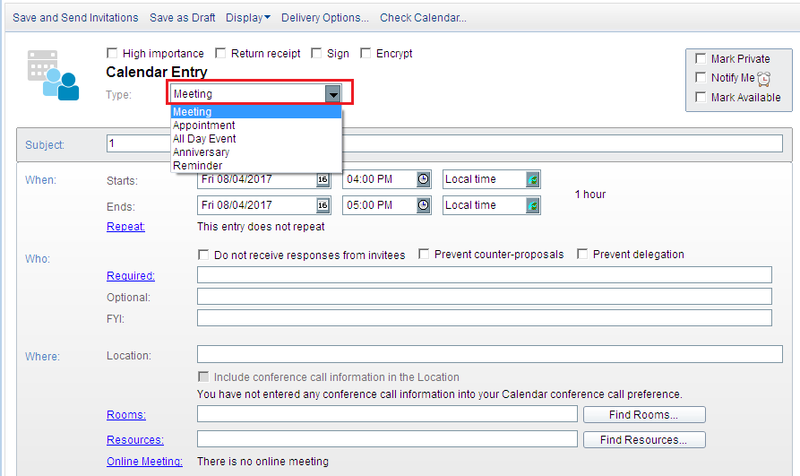 Now click on Save and Send invitations button to schedule a meeting in Lotus Notes 9. You can verify if the meeting is scheduled or not. Just click on All Documents and click on the schedule you have created as shown. If you have scheduled meetings for single or more than one day, then you can see it on Calendar as well. Just click on the Calendar icon as shown and open the month in which you have scheduled the meeting. As you can see below that time is mentioned on the days meeting is scheduled. Accept: Invitees will accept the invitation by using this button. Decline: By this, the candidate had declined the invitation. Respond button: It contains some options displayed below in order to accept or decline the invitation for any reason. 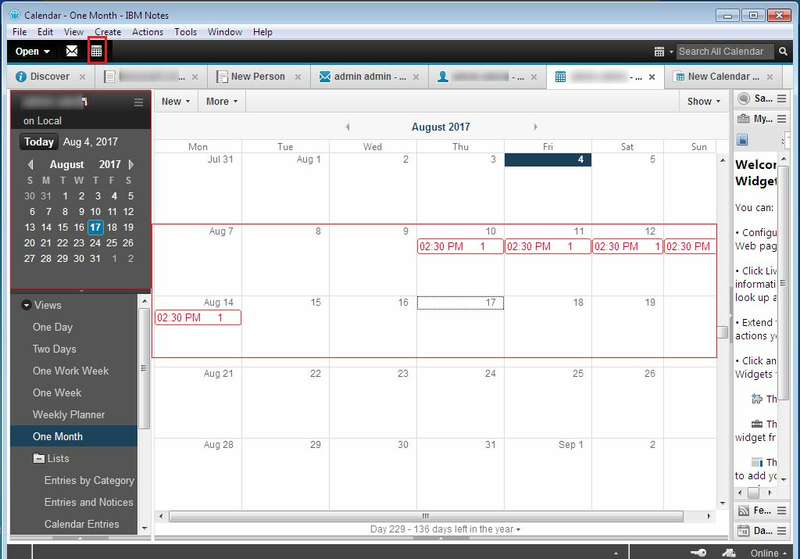 The following article includes a step by step guide to schedule a meeting in Lotus Notes 9. 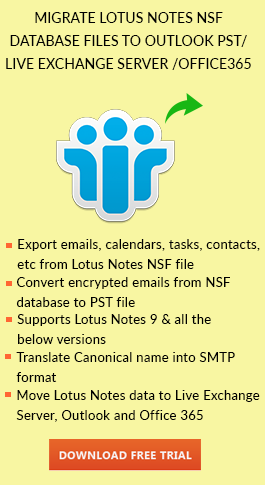 In this article, you can organize a meeting and send meeting invite in IBM Lotus Notes. You can verify the arranged schedules in your application as well. 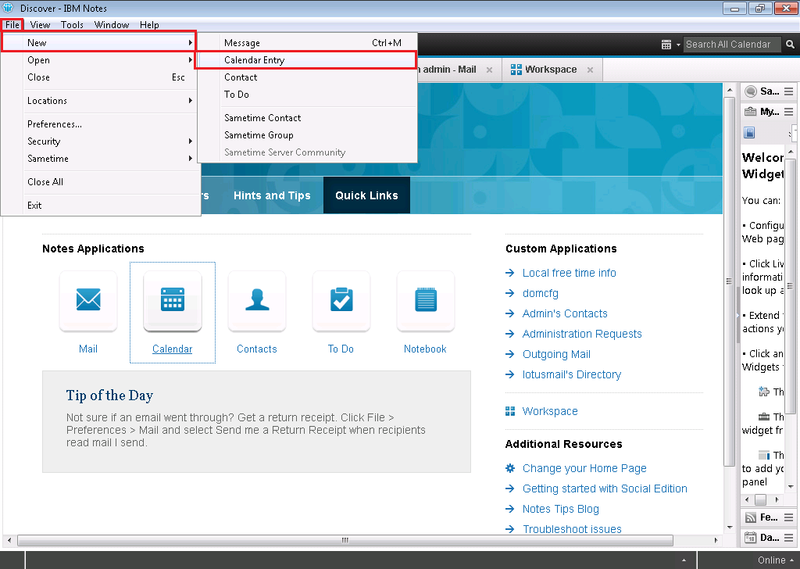 You can respond back the invitation in Lotus Notes. Export Notes to Outlook with the best software. Download now for trial.